If you drew the conclusion that theatre is too nice these days, just wait until you see what unfolds in Butcher on stage at the Panasonic Theatre from March 26-April 9, 2017. Let it be said, ethnic genocide can really bring out the worst in people. Weyni Mengesha steps outside her storytelling comfort zone in Butcher, a spine tingling presentation of horrific proportion on stage at the Panasonic Theatre. In doing so, the daring director slices up some beastly scenes while preventing a ghastly narrative from becoming lost in emotional translation. Which begs the question, ‘Is there a better way to pay homage to Nicolas Billon’s unapologetic tale of revenge and retribution?’ The answer is a resounding no. That’s because every now and then a play comes along that challenges everything you thought you knew about the boundaries of theatre. Comically dark and shockingly palpable, the set up and the take down defy conventional stage plotting. What’s odd is that this thoroughly entertaining psychological thriller opens like an episode of the 70′s sitcom Barney Miller if it were reintroduced on HBO. Inspector Lamb (Tony Nappo) is full of bad coffee and bad jokes when a mysterious immigrant wearing a war uniform, Santa hat, and a meat hook arrives at his police station on Christmas Eve. A business card offers an identity clue but intellectual property lawyer Hamilton Barnes (Andrew Musselman) is at a loss as to why the non-English speaking holiday visitor would be in possession of such. A call is placed to translator, Elena (Miranda Calderon), to confirm the man’s identity. The trio wrestle with hearsay and conjecture only to bring forward the undeniable truth with a simple Google search. Playgoers hold on tight as heightened tension seizes everyone in the venue with one heart-stopping surprise after another. 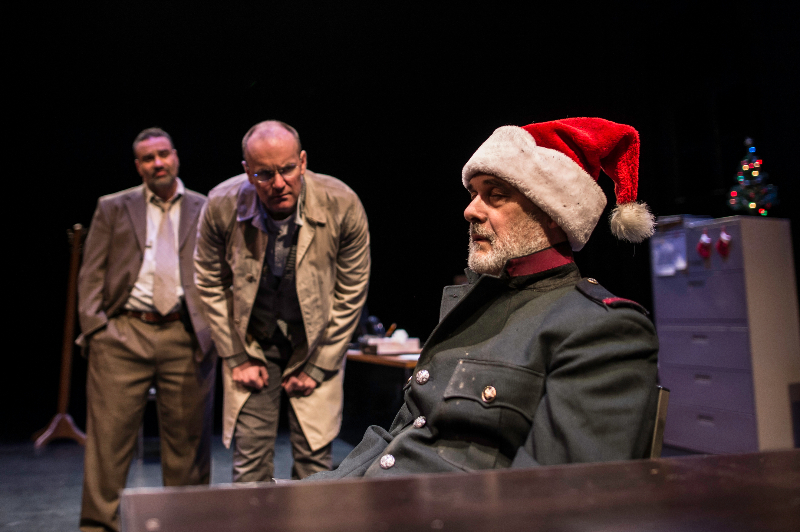 John Koensgen as Josef Dzibrilovo is credibly sharp with panic and confusion gripping the character’s plight. With Andrew Musselman’s role morphing from moral reasoner to heroic defender you can’t help but feel conflict resolution is on the near horizon. Not enough can be said about Tony Nappo’s remarkable contribution to this offering. His lighthearted law enforcer is played with such cleverness the audience easily forgets its experiencing a live theatre event. Yet it’s Miranda Calderon who owns the stage moments after she walks in. Her anger is refreshingly unrestrained and despite Elena proving to be the pot calling the kettle black, her pursuit of justice lacks no motivational understanding whatsoever. It’s almost impossible not to cheer for this subversive nemesis. Stupefying and unapologetic, it’s an entertainment game changer. PLEASE NOTE: This story is a republished information circular of the 2016 Dora Award winning production featuring the same cast with the exception of Miranda Calderon replacing Michelle Monteith as Elena.